> am I doing here? > > non-starter, but a disqualifier. > before or after the architectural design. > palace facade on a serekh? Now you might think this is sycophantic ... or is it 'chest bashing'.... you call it? Firstly, I asked a somewhat similar type question of Thanos some long long 5yrs? ago. Q (Something naïve like) "Thanos5150... great work yada yada... I am wondering if there is a specific building in Mesopotamia that the style is based on? Answer: (Something like:) ....not one specific first building identified as still extant, but it singular may have existed. However there are rather many of them, both in ancient Mesopotamia and Egypt that conform to the general style. Then not only that but it is discovered that back in ancient Gaul / Normandy (France) before Norman invasion their kings also had a crest with similar looking façade. What do you reckon? Would they make the symbolic identifying crest Coat of Arms, out of a dreamt up, yet to be made imaginary building, or would the building in some form have been built or likely come first? Try to run that through the super logical think tank! What you are likely asking though is has one or the other extant examples of either been found and dated dated as original and first? Well unless you have had a major change of perception or brain transplant recently, you almost invariably habitually doubt or dispute virtually any or most dating offered by any professional Archaeologist's or Egyptologist's anyway ! Or you might be alluding perhaps to this phenomena had nothing to do with either very ancient Mesopotamian or Egyptian cultures but belongs to a non attested unrelated "other" culture. This you will have to produce the evidence for yourself. Suggest start looking and digging at GT or Turkey! Now has that 'new brain' clicked into gear yet?..... and realised you are posting in the wrong thread? The façade part is not plan view it is elevation view (façade) the glyph you refer to as "uraeus" is simply Djet Horus name . 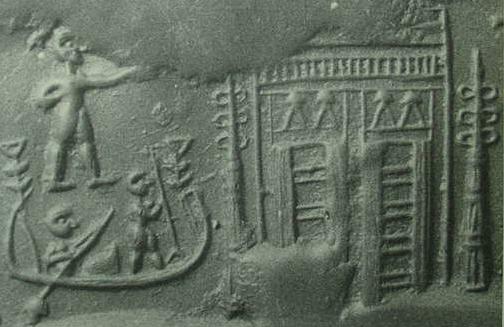 It is fair to think the "courtyard" is plan view and enclosure wall , as some describe it like that but it is the outline forming a place that later serekhs included the glyph spelling of Kings Horus name were enclosed /written (previously outside or alongside. It also forms a perch for the almighty perhaps celestial symbol of royal power /God affiliated sanction the Horus falcon. Seen also in Mesopotamian art iconery symbols all over in somewhat different form. Ok at least if I have made mistakes, I feel maybe if I ask nicely, Thanos will correct me. But my guess ....don't count on it. I hope that helps the nagging dilemma? Edit PS: Now if you are thinking of a nah nah 'come back' something like.... there are no Lions in Britain or definitely no unicorns in Scotland! Then..... do you think they could have made a wild guess and dreamt up what a big cat might look like sight unseen and struck it lucky and it turned out consistent or they later bred or imported them , or that mythical unicorns were not already folklore before it made the Scottish Royal CoA? Edited 1 time(s). Last edit at 05-Apr-18 07:24 by Corpuscles.